This web site is dedicated to the shtetl of Boyarka, Ukraine, which once had a vibrant and thriving Jewish community. May the memory of all the Jews who lived there, and died there, be remembered by future generations. I learned of the shtetl of Boyarka from a genealogy chart, given to me by a relative. The chart showed that I had a great-great uncle, a great-great aunt, and many cousins who had lived in Boyarka. These relatives were related to my family from Stavisht (Stavishche), which is 21 miles away. When I started to research this small community, I found little information on the Internet to satisfy my curiosity. I knew that I would have to find out more about Boyarka, and then share that information with others. Therefore, this KehilaLinks site is my gift to descendants of Boyarka, so that this little shtetl will never be forgotten. I must give thanks to the many people who contributed to this site, for without them it would not be rich in content. A sincere THANK YOU to Dan Goldberg, Leora Cassells, Lily Yurkovsky Rapaport, Zina Sokol Hirsh, Jeremy Borovitz, Michael Weisser, Paul Katzeff and Elliot Burko. The first mention of Jews in Boyarka stretches back to 1625, where according to tax documents of the Russian empire, 3 Jewish families lived in the settlement. Growth, however, was slow, and by 1765 the number had only increased to 13 (likely families, but the data is unclear.) Yet while Jews were not moving to Boyarka en masse, the region was still beginning to get infused with Yiddishkeit (Jewishness.) Nearby Lysyanka, just 20 kilometers away, already had a sizable Jewish community, and in fact fell victim to a violent pogrom by the Haidamaks, a Cossack group. (As a historical side note, after ravaging Lysyanka the Haidamaks traveled to Uman, where the Jewish community mounted a gallant defense. Although many were eventually killed, their martyrdom was later honored by Rebbe Nachman of Bratslav in his choice to be buried there, this sparking the pilgrimage that continues to this day). It is unclear whether or not the Haidamaks ever came to Boyarka, but for some reason between 1765 and 1768 the Jewish population decreased, from 13 to 7 families/individuals. It is possible that people were killed or moved out of fear or simply a fact of changing demographics. This, however, would be the last decrease in the Jewish population until the outbreak of World War I. As the 19th century approached, the Jewish population of Boyarka began to increase rapidly. The community was officially registered in 1837. While this doesn't have a corresponding figure, it can be assumed that if a community was already formed, then it was beginning to have a significant population. Census data from 1847 tells us that 450 Jewish individuals were living in Boyarka, and by 1854 this figure was up to just over 500. In 1854, we also have some information regarding some of the religious leaders of the community. Leiba Kagan served as the teacher of the community, Avrum Sklyarski was the community's treasurer, and Chaim Sokolov served as the Chazzan (Cantor) during religious services. While the community did not yet have a Rabbi, or a Synagogue, it was clearly a community on the rise. In 1858, at least 92 Jewish households are already registered in Boyarka, and many of them already had their own businesses. 1863 was the culmination of this quarter century of mega growth, as Boyarka opened its first official synagogue. About 8 kilometers away from Boyarka was the small village of Sofiika. There Elimelech Loyev, a wealthy Jew, managed the estate of Graf Potofsky, a Polish magnate. In 1877, with his daughter growing up without a solid Jewish education, he invited a young, learned Melamed (teacher), named Sholum Rabinovitch, to come and be her private tutor. During Sholum's time in Sofiika, he often came to the village to spend time with the local Rabbi, Dovid Kurzhner. In 1879, Sholum and Goldie, his student, ran away from home with the intention of marrying. Her father was obviously none too happy about this development, but eventually Sholum, Berach, and Goldie were able to reach a peace. Sholum went on to be a well known (if not always financially successful) writer, publishing hundreds of stories that chronicled life in the Shtetl. His pen name? Sholom Aleichem. By 1900, there were about 720 people living in Boyarka. Once the pogroms of 1918-1921 were over, there were almost no Jews left in Boyarka. The mass migration from the small, but close knit shtetl, was the end of a way of life for the residents. Many of the Jews of the Russia fled to Bessarabia during the pogrom years. There they waited for more peaceful times in order to return to their shtetls, or to await Visas for passage to America or other locations. I was fortunate to have been given the Visa of my Yurkovsky relatives (Smiel, Frima, Leya & Zusel) that was issued in 1923 in Romania. (Click here to view Visa.) Please note the spelling of the town of origin - "Boiarka" on the document. Thanks to Leora Cassells for allowing this document to be published on our site. Many, if not most, of the Jewish population of Boyarka found its way to America. However, they were determined to remain a community. In 1923, the newly transplanted immigrants formed a landsmanshaften, the Boyerke Benevolent Society. Several years later, the women of Boyarka formed a woman's auxiliary, the Boyerker Heimishe Ugent. The Society had an Emergency Fund and a Scholarship Fund. The Society purchased a cemetery plot at Beth David Cemetery in Elmont, New York. Thanks to my cousin, Leora Cassells, I have a list of those buried in Beth David, as of June, 1994. (To see the list, go to Database Page.) In the 1930's, the Society erected a monument at Beth David Cemetery in memory of those who were murdered in the pogroms. (Go to Picture Page to see monument, and Database Page for the names on the monument.) As the community started to age, they were worried about space in the Beth David Cemetery, so they purchased an additional Society plot in the Beth Moses Cemetery in Pinelawn, NY (Wellwood Avenue.) According to the person in charge of the Society burial grounds, very few people have been buried in Beth Moses thus far. The Society produced a number of anniversary journals over the years. The Forty-Fifth Anniversary Souvenir Journal was produced for a big celebration event that the Boyerker Society held in 1969. Thanks to my cousin, Dan Goldberg, we all have access to it. 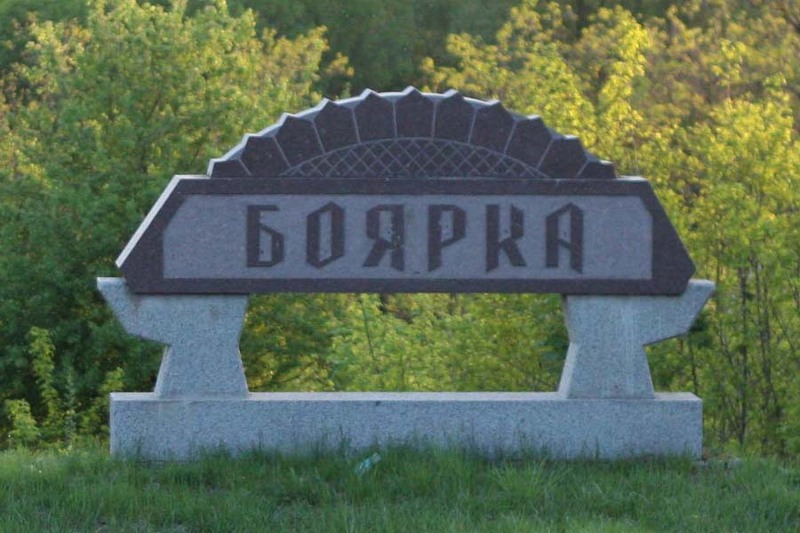 Please visit the Journal Page to see dozens of pictures and a few stories regarding Boyarka and its residents. On the Database Page, you will find lists of Surnames names, from various sources, that are associated with Boyarka. Copyright © Karen Isabel Sanders 2013. If you have been aided in your research by this site and wish to further our mission of preserving our history for future generations, your JewishGen-erosity is greatly appreciated. If you have been aided in your research by this site and wish to further our mission of preserving our history for future generations, your Jewisn-erosity i appreciated.